My wife and I were coming back from walking the dogs recently. As we turned the corner from the sidewalk onto the path to our front door, we noticed a dinner fork buried in the Jerusalem sage (phlomis fruticosa) under the manzanita tree. This was a bit of a mystery. I chalked it up to one of the kids taking a snack out into the front yard and dropping a fork. 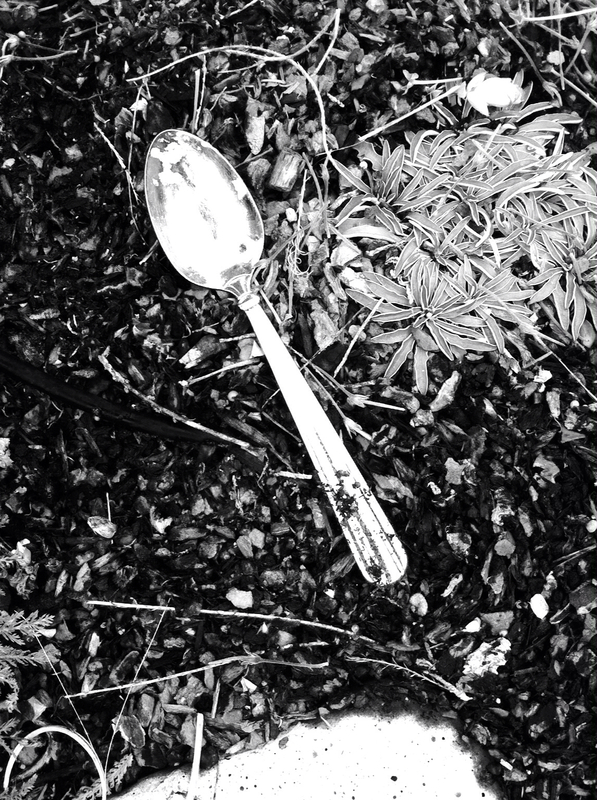 For dramatic effect, a “noir”-ified image of a spoon similar to the one that mysteriously appeared in our garden. A week later my wife tells me she’s discovered a teaspoon in the kangaroo paw (Anigozanthos rufus). We inquired with the kids. Our son, the likeliest suspect on account of the way in which the mental space he devotes to Minecraft leaves few reserves for attentiveness to things like eating or keeping track of utensils, denied culpability. I let this mystery sit with me for some time. I went for a bike ride. When I got back from the ride I rolled my bike, which held two empty water bottles, down the driveway and past the crime scene that our front yard had become. As I opened the garage and thought about quenching my thirst, the explanation for the unsolved mystery occurred to me. Many months back, we stopped watering our lawn and let it turn to the beautiful gold that dried grass becomes. California is known as the Golden State, after all, not because of the gold rush but because of the prominence of coastal ranges defined in the dry season by a golden uniformity occasionally interrupted by a cluster of live oaks. Our grass turned gold but we still have a small vegetable garden in the back yard and landscaping in the front that need watering. Then a couple months back, when much of the state had moved from “extreme drought” to “exceptional drought” conditions, my wife put a white tub in the sink to begin catching our gray water. When the tub fills, one of us lugs it to the yard to water the plants. If the water is “gray” enough, it’s easy to fail to see a piece of silverware at the bottom of the tub. I’d like to pin the whole thing on Minecraft, except that the fork was found shortly after my son returned from a week visiting his grandmother and my wife and daughter returned from a trip of their own. The spoon? Unfortunately the evidence was destroyed. The spoon, which was found with food still on it, was washed before I could inspect the nature of the food to link it to a particular eater in our household. The best I could do was re-enact the crime scene. The lesson from the mystery obviously is not that the drought has a nice benefit of growing silverware. Rather, it’s about habits. What fascinates me about the mystery is how it reveals the subtle ways in which behavior, and in particular habits, shift. And it’s not the tub in the sink I’m talking about. 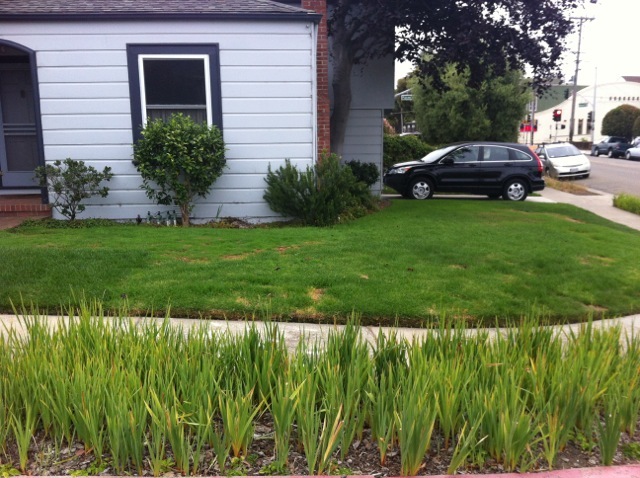 It seems safe to assume that our efforts to collect gray water place us in the minority of Californians, at least based on my informal observations of lush though small lawns around my neighborhood. I’m talking about the habits revealed by the presence of a tub in our sink. One such habit is dropping dirty dishes in the sink. Our dishwasher happens to be powerful enough to make pre-washing generally unnecessary. But those of us in the household without the habit of putting dishes directly into the dishwasher drop them in the sink. It’s just a habit, but a habit that becomes significant due to a modest shift in the physical environment (i.e., our sink). We don’t want silverware growing in our garden, so the tub system requires development of new habits like placing dishes directly into the dishwasher. Alternatively, we could develop the habit of scouring the bottom of the tub for silverware before dumping the water in the garden. As a side note, the sociologist in me has to point out that the way a family’s habits evolve has a lot to do with age and gender dynamics shaping, for example, who is the primary washer of dishes (or loader of the dishwasher). Whichever route we go, behaviors can change with a slight nudge. What’s more, it doesn’t take long before the new behavior becomes habit and conscious thought about what to do with the dishes is not required, not even for Minecraft-fixated brains. The bigger question is what does it take to nudge us toward new behaviors? The California drought, despite its severity, is not causing much behavior change. For me, the reality of the drought didn’t hit me until I spent a weekend at Lake Oroville, which is California’s second largest reservoir and is currently at 35% of capacity and 48% of historical average. Even if we were certain it would lead to behavior change, it’s not possible to take all Californians to a reservoir to see first-hand the gravity of the situation. What might be more powerful at changing behavior than images of near-empty reservoirs? Humor? That’s the strategy of Save Our Water and NRDC who teamed with Conan O’Brien and his sidekick, Andy Richter, to produce a series of public service announcements following Governor Brown’s request in January that Californians cut back water use by 20 percent (a goal that no region in the state has reached yet). The problem is that public service announcements are premised on the notion that information alone is sufficient to change habits. Are there other options? Well, laws are pretty good at changing behaviors. We must have looked perplexed because he proceeded to explain that the customers had stepped outside for a cigarette. Sensing our skepticism he elaborated: The glasses that appeared to be empty had coasters sitting atop them. This, according to the bartender, was the habit of drinkers who because of the new anti-smoking law were now forced to vacate their seats to go outside to smoke. The coaster signaled that the smokers intended to return for another drink. Just like that, the new law had created new habits. Could water pricing policies help grow silverware in Californian’s gardens? Only 7 percent of the state’s water agencies have approved drought pricing strategies this year. These “drought surcharges” are effective at incentivizing conservation while maintaining revenue streams as agencies sell less water. But don’t drought surcharges amount to a flat tax? And wouldn’t they burden poor people more than the rich? Tiered rate structures could be designed that keep water affordable when consumed at subsistence levels. Households watering vast lawns and refilling evaporating swimming pools–which most would agree are nonessential uses–would fall into higher tiers and be charged at higher rates. In Drought Watch: Our Thirsty Lawns, the Public Policy Institute of California (PPIC) reports that “more than half of urban water agencies currently have some form of tiered rates,” adding that these effective measures are threatened by recent legal challenges to their constitutionality under Prop 218 (reported by PPIC here). PPIC also suggests that tiered rate structures could help “send a message about the real costs of our landscaping choices”–a message that is likely to have a greater impact on habits than Conan O’Brien’s humor. Finally there is the collective action problem, which O’Brien’s joke about the cranberry bog in the desert subtly evokes. The cranberry bog is proxy for California’s agriculture. Californians hear various figures about how much of the state’s water is consumed by agriculture. According to Blaine Hanson of UC Davis’ Department of Land, Air and Water Resources, the figures vary according to the denominator chosen, ranging from as high as 80% when based on the total developed water supply (the amount of water captured in the state’s water system annually) to as low as 29% when based on the total water supply of a wet year (when the developed supply is greater and there is less demand because of direct rainfall on crops). This presentation (PDF) by Hanson explains the complexity of the issue quite well. More important than the actual usage or how it’s calculated is the perception. And the perception in California is not only that agriculture hogs the water, but that it uses it inefficiently. Consequently, given the perception of the scale of water use by commercial agriculture, your typical urban dweller feels no compulsion to let a small patch of lawn go gold. 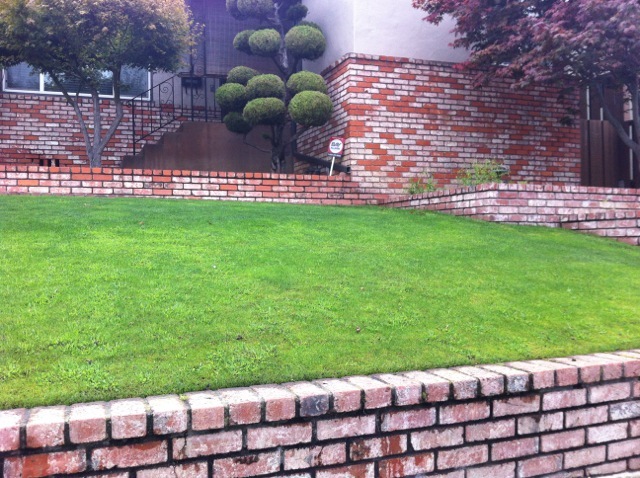 How could a few hundred gallons of water applied to a 150 sq ft lawn possibly make a difference? Why should I carry the shame of a dead lawn when my neighbors continue to maintain their lush lawns? So goes the logic, a logic best undermined by the kinds of nudges that policies can create. Let’s hope that silverware growing in our gardens becomes the new “coaster on the pint glass,” indicating to passersby that new policies–perhaps in the form of tiered rate structures or other water pricing mechanisms–have begun to create new habits.